I just completed my first personal growth creative project of the year and am excited to tell you about it! It’s a project that’s ideal for this time of year, not just because of the New Year but because the bitter cold, shorter days present a wonderful opportunity for going inward when it’s too cold to spend much time outdoors. I overhauled my vision board so it sparkles with fresh, new energy! I created my first vision board two years ago. It was a simple one on which I glued pictures and words that inspired me and supported my goals. That year, I focused on abundance and freeing myself from abundance blocks and therefore included several positive affirmations related to prosperity. It was a memorable experience because I completed it before going to bed one night, and I hadn’t even fallen asleep before I received a phone call from my daughter who told me she was in labor! It was perfect timing. Later in the year, I created another vision board – a supercharged feng shui version – after returning from a life-transforming trip to visit relatives on the Sunshine Coast of British Columbia. Spending nearly two weeks with them was a profound experience that helped me to better understand myself and where I come from. In the company of relatives who share my love of nature and my affinity for artistic creativity and writing, I experienced a sense of true belonging and being appreciated for who I was, rather than feeling like the family oddball. Finding my tribe right in my family tree changed everything, and a new vision board was in order. I put my vision board on the wall next to my bed, and every morning it was the first thing I saw when I woke up. Then I’d bring it downstairs so I’d see it during the day. It was with me day and night, and I even photographed it and printed out a mini version to carry around with me. The energy coming off it was that powerful, and I found it to be a highly motivating tool for creating a more authentic and empowered life. As I achieved various goals, I’d remove those pictures/words from the vision board, to make room for new ones and keep it current. However, I noticed that for the past month or two, my vision board remained on my bedroom wall. The spaces on it made the placement of the remaining pictures and words seem not quite right (visual person that I am), and it just didn’t have the oomph it used to have. I didn’t feel drawn to it because it felt cluttered. There were some pictures and words on it that didn’t resonate anymore, especially in the Career section. Too many different possibilities which made me feel pulled in too many directions. Also, I’d recently undergone another big, inner transformation as a result of decluttering my entire home and focusing on mindful self-compassion for the past year. Now it was time to declutter my vision board and infuse it with fresh energy that fit with the new me! I used the existing structure to revamp each section, and now it sparkles with inspiring energy again, and it doesn’t stay on my bedroom wall! I enjoy creating simple, daily rituals to keep me focused on what’s most important and recently came up with a new one that features my vision board and feels really good, too! I love to give myself hand and foot massages and remembered that I have a foot massage roller that I haven’t used in a while and Chinese medicine balls, as well. So I put them under my bed and start the day sitting on the edge of my bed and using the hand and foot massagers while looking at my vision board for a few minutes and reminding myself of what’s most important. Sweeeet! It’s a great way to get focused first thing in the morning. Another ritual I enjoy is to look at my vision board while doing my “tea meditation”. (I wrote an article about it.) Essentially, it involves practicing feeling the feelings of attaining my vision board goals as I hold the cup of tea in my hands, and imagining those feelings going into the tea before consuming it. It’s one of my favorite cold weather meditations! If you’ve never made a vision board, it’s pretty simple to do! It used to be that you’d need a stack of magazines to look through for inspiring words and images, but Google searches make it so much easier to find inspiring images now! Magazines are still good sources of words, but you also can print out words yourself using different fonts and colors. I hold onto the Omega and Kripalu retreat center catalogs that come in the mail, for words and ideas. Hay House and Sounds True have some really great book and audiobook titles that are great for vision boards! And my Inspirational Photo Gallery and Instagram account is filled with “quote pictures” (my latest creative passion!) – some of which I included on my own vision board. There are so many sources of vision board inspiration available! There are apps to create virtual vision boards, and another option is to create a Pinterest board for a vision board. 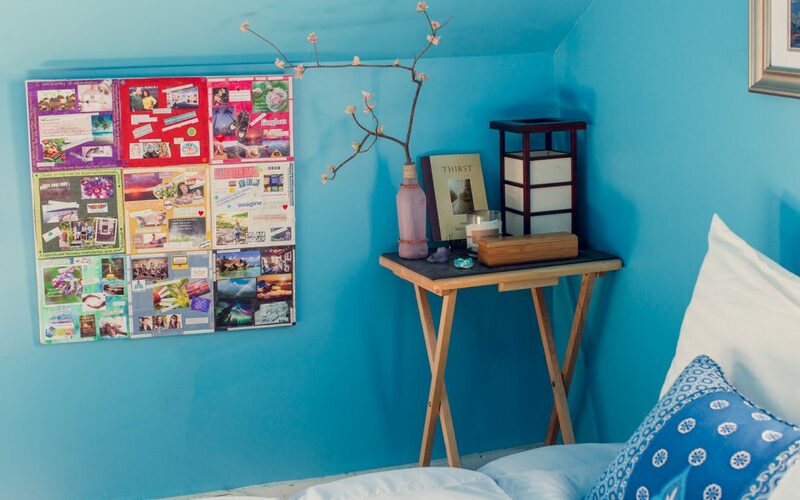 However, there is value in creating a physical vision board because you only have a limited amount of space to fit what’s most important to you. That cuts out a lot of clutter and can help you stay focused. Making a vision board is a great cold weather project. I really appreciate this time of year because it’s a time to go inward, get in touch with yourself, and decide what you want to cultivate in your inner garden this year – how you want to expand. If you’re interested, Google “vision boards” for some inspiration, and give it a go!